Posted: Mon, Sep 16, 2013Industry Watch : 2014 Polaris RMK Gets an Improvement! The Pro RMK 800 is the #1 selling sled in the mountains. How can Polaris make it even better? The 2014 Polaris Pro RMK gets an improved Quickdrive system, updated piston rings, small refinements and tighter tolerance thresholds to improve reliability. The Quickdrive belt will be 25% stronger at hot temperatures and 40% stronger at milder heat. The specifications for each pulley will also have a higher production standard to reduce failures before and after the break in period. No tensioner and no machined pulleys. Improvements to tolerances for the drive and jackshaft as well as torque specifications have changed to eliminate failures and premature shaft/bearing failures. A Service Bulletin was released to adjust torque specs last Friday for the 2013 Pro RMKs that will improve durability as well. The 2014 Polaris Pro RMK 600 and 800 will come with the driveshaft collar from the factory that was added to the 2013 models. The 2014 Polaris Snowcheck color combinations and accessory options seem infinite with multiple options of colors and graphics for not only the hood and side panels, but factory customized colors for the windshield, ski loops and rails. The 2014 Polaris Pro RMK LE comes in 10 major colorways: Matte Stealth Black, Matte Stealth White, Gloss Orange Madness, Matte Turbo Silver, Matte Nuclear Sunset Orange, Gloss White, Gloss Black, Gloss Red, Gloss Midnight Blue or Gloss White Retro. Pick from a Mid-Matte Black Windshield or the Low Black with Handguards. A handlebar bag, Underseat bag and Burandt Lock & Ride Tunnel bag are all factory options for snowcheck. Voodoo blue (and some other) side panels are available. Billions of colors are great for a custom look, but don’t add power and reliability. As for the 2014 mountain sleds, Polaris engineers have addressed the most important durability needs in their quest to deliver the perfect snowmobile for the mountains. PICKERINGTON, Ohio -- A dominant AMA Supercross and motocross champion nicknamed "The GOAT" (The Greatest Of All Time), a pair of riders who helped raise tens of millions of dollars in search of the cause of and cure for pediatric brain tumors, and a founder of one of the aftermarket's most recognizable brands are among the motorcyclists who are on the 2013 ballot for possible elevation to the AMA Motorcycle Hall of Fame. Multi-time AMA champion Ricky Carmichael, the Ride for Kids' Mike and Dianne Traynor, and K&N co-founder Norm McDonald are among the nominees on the 2013 AMA Motorcycle Hall of Fame ballot that includes racers, designers, tuners, and ambassadors for motorcycling in consideration of elevation to motorcycling's highest honor. "Very few people start their careers in this industry or sport expecting to end up in the AMA Motorcycle Hall of Fame, however the very best always rise to the top, as we see again this year," said Jeffrey V. Heininger, chairman of the American Motorcycle Heritage Foundation, which oversees the Hall of Fame. "The AMA Motorcycle Hall of Fame truly encompasses the standout riders and racers, especially those driven to excel beyond mere greatness. What's particularly impressive this year is the breadth of that drive across all types of motorcycling represented on the ballot, from racing, to business, to rights, to engine design and more. These 2013 nominees epitomize the essence of the American Motorcyclist Association." Indian Powerplus designer and engineer Charles Gustafson Sr. The 2013 AMA Motorcycle Hall of Fame Nominating Ballot is the culmination of a comprehensive review of the procedures and makeup of the Hall of Fame nominating processes and committees. The revisions are designed to institutionalize the integrity of the nominating process, from application through induction into the AMA Motorcycle Hall of Fame. Potential AMA Motorcycle Hall of Famers are considered in eight categories, each focusing on a specific area: Ambassadors & Industry, Design & Engineering, Dirt Track, Leadership & Motorcycle Rights, Motocross & Supercross, Off-Road, Roadracing and Specialty Competition. With the ballot now set, the official voting begins. Votes for the Hall of Fame class of 2013 will be cast by: all living Hall of Fame members; members of the AMA and AMHF Boards of Directors; and members of and advisors to the Category Committees. The current total number of eligible voters is more than 250. Voting will open June 18 and will close on July 7. Ballots were mailed Monday to voters. The members of the AMA Motorcycle Hall of Fame Class of 2013 will be announced shortly after the conclusion of voting in early July. The class of 2013 will be officially inducted on Friday, Oct. 18, during the AMA Motorcycle Hall of Fame Legends Weekend in a star-studded gala at Las Vegas' Green Valley Resort & Casino, with tickets available to the general public. Also featured at the AMA Motorcycle Hall of Fame Induction Ceremony are two "Hall of Fame Legends" -- existing members of the Hall of Fame whose lifetime accomplishments are highlighted. The 2013 Legends are: Mark Blackwell, a pioneering racer in American motocross, a six-time AMA championship race team manager and a well-respected executive in the motorcycle industry; and Torsten Hallman, a four-time World Motocross Champion who was instrumental in introducing the sport of motocross to America and founded the Thor brand. Also part of the weekend's activities is the AMA Motorcycle Hall of Fame Dave Mungenast Memorial Legends Reception on Saturday, Oct. 19, where the class of 2013, the 2013 Legends and AMA Motorcycle Hall of Famers from previous years will be honored and interviewed on-stage in a relaxed setting that allows fans and friends to get up close and personal with motorcycling's heroes. The AMA Legends Weekend is a fundraiser for the AMA Motorcycle Hall of Fame, located on the AMA campus in Pickerington, Ohio and overseen by the American Motorcycle Heritage Foundation. The mission of the AMHF is to celebrate, elucidate and preserve the rich tradition of motorcycling in America. For more information, please visit www.motorcyclemuseum.org. Over the past 25 years, Mark Buckner profoundly influenced the world of motorcyclists' rights, safety and education through his presentations nationwide on strategic planning, organizational design and member effectiveness. He has spoken in most states and delivered more than 100 presentations at state, regional and national motorcyclists' rights conferences. When he was president of the Motorcycle Riders Foundation, the MRF worked well with the AMA on government relations-related issues. When AMA Supercross and motocross racer Ricky Carmichael retired in 2007, he held the AMA Supercross/motocross all-time National win record with 150, a record that still stands. From 1997 to 2006, Carmichael won a championship series title each year (16 total). In 2002, he recorded the first-ever perfect season in AMA Motocross history by earning 24 straight moto victories for 12 overall wins in the premier class -- a feat he repeated in 2004. Richard Gross raced professionally from the 1930s until 1950. But his greatest contributions to the sport came after his retirement from competition, when he developed a "four-cam" version of the 1948 Indian Big Base Scout engine that claimed the AMA National Championship in Springfield, Ill., for three consecutive years: 1951, 1952 and 1953. That is significant because only twice in the 66 years since the end of World War II has a manufacturer other than Harley-Davidson won three consecutive national championships. Born in 1863, Charles Gustafson Sr. began working in 1895 at the Hendee Manufacturing Company, which would become the Indian Motocycle Company. A self-taught engineer, Gustafson went to work for the Reading Standard Company in Reading, Pa., in 1906, where he developed the side-valve engine that became the basis for all future Reading Standard motorcycles. He returned to Hendee Manufacturing in 1907, eventually becoming Indian's chief engineer. He developed the first side-valve Indian engine that debuted as the Powerplus in 1916, and is credited with developing the kickstarter that changed how motorcycles were started. Danny Hamel accomplished much as an off-road racer: five-time AMA Hare and Hound National Champion, Baja 1000 and 500 overall winner and more. Since the AMA began the practice of recognizing an AMA Amateur Athlete of the Year and Amateur Sportsman of the Year in 1977, many of the sport's greats have been singled out for their contributions to the sport. But up until 1995, Hamel was the only rider ever named both as the Amateur Athlete of the Year and Amateur Sportsman of the Year in the same year. He died in June 1995 while racing the Baja 500 when a car strayed onto the road that was part of the course and Hamel hit the car broadside. At the time of his death in 1941, Tommy Hays held several Class C (production) racing records, including most career National wins (8) and most career National TT wins (7). He was the only rider in 1941 to claim more than one AMA National win, and had won three of the four AMA Nationals leading up to the season-ending Oakland 200 race in California in which he was killed in a crash. He earned AMA Most Popular Rider of the Year honors for 1941. That honor is now called AMA Pro Athlete of the Year. Joseph Hemmis was the winningest hillclimber from the post-World War II era through the 1970s, taking home five national championships. Up to and including the 1977 AMA Pro Hillclimb season, Grand National Hillclimb Champions were determined by the results of a single event, normally held in Muskegon, Mich., or Jefferson, Pa.
Jack Johnson won major desert races in four consecutive decades, starting with first overall in the Mint 400 race in Nevada in 1975 to first motorcycle overall with teammates in the Baja 1000 in 2007. In 1975, he earned the Mint 400 overall win with teammate Mark Mason on a Yamaha. He then rode briefly for KTM, and then joined Team Husqvarna. He won the Mint 400 in 1976 for Team Husqvarna with teammate Rolf Tibblin. In 1979 he won the Baja 500 as well as finishing first overall riding alone. He continued winning Baja competitions in the 1980s, 1990s and 2000s. Bob Leppan was the world's fastest motorcyclist from 1966-70. His two-way average of 245.667 mph set in August 1966 at the Bonneville Salt Flats in Utah was 15 mph faster than the previous ultimate motorcycle world record set in 1962. His record machine was the Gyronaut X-1, an innovative streamliner powered by two alcohol-burning Triumph twins fitted to a special Logghe Brothers chassis and wrapped in an aerodynamic shell designed by famed automotive stylist Alex Tremulis. Leppan also set records in the 1970s as a motorcycle dealer with Triumph sales. Norm McDonald has been an ambassador for motorcycling his entire life as a racer, promoter, teacher, sponsor and advocate for motorcyclists' rights and safety. He began his racing career in 1956 in California. In 1957 he opened K&N Motorcycles-a motorcycle shop-with Ken Johnson. By 1965 they created K&N Engineering and in 1966 the K&N Air Filter was introduced. Over the years McDonald sponsored hundreds of racers, with more than 30 of them going on to the national level. In 1971, McDonald ran a dealership in Tulsa, Oka., and was very influential in creating events to get people involved in riding, including coordinating poker runs, secret destination rides, scavenger hunts and more. In the 1980s and 1990s he was active in various roadracing organizations. Randy Renfrow began his pro roadracing career in 1981. He won the AMA 250 Grand Prix championship in 1983, the Formula One title in 1986 and the Pro Twins Series championship in 1989. He was known for his ability to be competitive on any type of machinery, from diminutive 250 Grand Prix bikes all the way up to AMA Superbikes, and he excelled in nearly every class of professional motorcycle roadracing. In all, he won 17 AMA Nationals in four different classes, including a victory in an AMA Superbike race at Willow Springs Raceway in Rosamond, Calif., in 1990 as a member of the factory Honda team. He died in 2002. Dragracer Joe Smith earned the U.S. national champion title in 1971, 1974 and 1975 in National Hot Rod Association-sanctioned events. His was the first drag bike to break the 9-second barrier: posting an 8.97-second time with a top speed of 167.28 mph at the Bakersfield Fuel and Gas Championships at Bakersfield Raceway in California March 1971. He also rode the first drag bike to under 8 seconds. In 1971 he held the strip record at three Southern California tracks: 9.07 seconds and 166 mph at Irwindale, 9.08 and 164 mph at Lion's, and 9.09 and 167 mph at Fontana. Gloria Tramontin Struck was born in 1925 in an apartment attached to her family's motorcycle shop in Clifton, N.J. That shop eventually evolved into Tramontin Harley-Davidson. When her father died in 1928, Gloria's mom continued to run the shop. Gloria learned to ride when she was 16. She joined the Motor Maids in 1946 and is still an active member. She has ridden her bike to every state on the continent and some states many times over. She was still riding long distances in 2008 at the age of 84. Mike and Dianne Traynor were the co-founders of the Pediatric Brain Tumor foundation and the Ride for Kids motorcycle charity program. They began the Ride for Kids in 1984 to raise funds for childhood brain tumor research. Its success led them to start in 1991 the Pediatric Brain Tumor Foundation, which is dedicated to finding a cure for childhood brain tumors. In 1992, the PBTF helped create the Central Brain Tumor Registry of the United States, which has accrued the nation's largest epidemiological database on brain tumors. With millions raised since 1984, motorcyclists have helped the PBTF become the world's largest non-governmental source of funding for childhood brain tumor research. Programs also include free educational information about brain tumors, Internet conferences and college scholarships. Mike Traynor died in 2009 and Dianne Traynor died in 2012. F. Eugene (Gene) Wirwahn laid the groundwork for this two-advocate department in 1972 to become the powerful force in the world of motorcyclists' rights that it is today. He not only became AMA legislative director at a time when both street and dirt riders were under attack from the federal administration and Congress, but this Alabama lawyer proved to be tenacious and successful in fighting bad laws, and creating good ones. Founded in 1990 by the American Motorcycle Heritage Foundation, the goal of the AMA Motorcycle Hall of Fame Museum is to tell the stories and preserve the history of motorcycling. Located on the campus of the American Motorcyclist Association in Pickerington, Ohio, the Museum's three major exhibition halls feature the machines and memorabilia of those who have contributed notably to the sport. The AMA Motorcycle Hall of Fame Museum recognizes individuals who have made significant contributions to motorcycling, including those known for their contributions to road riding, off-road riding and all categories of racing, as well as those who have excelled in business, history, design and engineering. More information can be found at www.motorcyclemuseum.org. Start your summer right with financing as low as 3.99%** and up to $1,700* off a hardest working, smoothest riding off-road vehicle. Already own one? Get $10 off an oil change kit¹ with a service & fluid check at your local dealer. 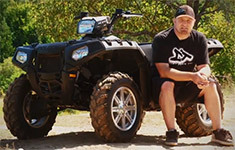 Dirt Trax TV puts the Polaris Sportsman XP 850 up against theCan-Am Outlander XT 1000 in their Big Bore Shootout. 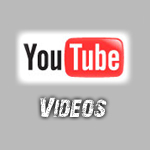 See who wins on YouTube, then check out the Sportsman XP 850 below. Please do not reply to this email. If you would like to contact us, please call us at 1-800-POLARIS or visit ourContact Us page. 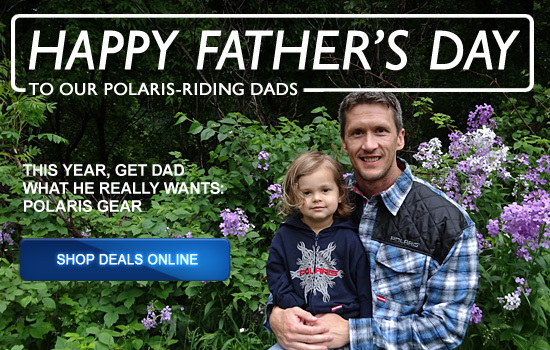 This email was sent by Polaris Off-Road Vehicles via ExactTarget. 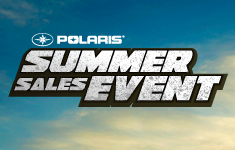 Summer Sales Event - CAN: Offers good on new and unregistered units purchased between 6/1/13 and 6/30/13. *On select models. See your dealer for details. **This is a limited time offer which is valid for the purchase of selected qualifying models and is subject to credit approval from TD Auto Finance (TDAF) on qualified purchases financed during this program. Offer may not be combined with certain other offers, is subject to change and may be extended or terminated without further notice. See participating retailers for complete details and conditions. Rates from other lenders may vary. Monthly payment and cost of borrowing will vary depending on amount borrowed and down payment/trade. Minimum amount to finance is $5,000. Example: $7,500 financed at 3.99% over 36 months = 36 monthly payments of $221.40 with a cost of borrowing of $470.27 and a total obligation of $7,970.27. Freight, license, PPSA/RPDRM, insurance, registration, any retailer administration fees and other applicable fees and taxes are not included in the financed amount. Dealers have freedom to set individual prices, but must be enrolled with TDAF to participate. $10 Oil Change Kit Coupon: ¹$10 off oil change kit offer only valid for a limited time. Coupon must be presented at time of purchase for discount to apply. Dealers and employees are not eligible for the discount. Not valid on non-Polaris products, after expiration date, or on purchases from the Polaris online store. The coupon cannot be used more than once and cannot be used with any other offer. Coupon can only be used on eligible Polaris oil change kits. Warning: The Polaris RANGER and RZR side by side vehicles are not intended for on-road use. Driver must be at least 16 years old with a valid driver's license to operate. Passengers must be at least 12 years old and tall enough to grasp the hand holds and plant feet firmly on the floor. All SxS drivers should take a safety training course. Drivers and passengers should always wear helmets, eye protection, protective clothing, and seat belts. Always use cab nets. Be particularly careful on difficult terrain. Never drive on public roads or paved surfaces. Never engage in stunt driving, and avoidexcessive speeds and sharp turns. Riding and alcohol/drugs don't mix. Check local laws before riding on trails. ATVs can be hazardous to operate. Polaris vehicles are for riders 16 and older. For your safety, always wear a helmet, eye protection and protective clothing, and be sure to take a safety training course. For more information, visit our website at www.polaris.com. All riders are professionals on a closed course. Polaris has released teasers of the new Indian Chief ahead of its introduction at the 2013 rally in Sturgis, South Dakota. Polaris obtained the brand in 2011 and the new bike will be a 2014 model. From the teaser photo, the new Chief appears to be long and low, a nod to the Chief models of the 1940s. Powered by the recently introduced 111 cubic inch thunder Stroke, the Chief retains some classic styling cues such as the fender-mounted figure head, valanced fenders and spoked wheels. Polaris owns the Victory brand which competes against the Japanese cruisers like Yamaha’s Star lineup. The Indians, manufactured in Iowa, are going to be positioned to go head-to-head with Harley Davidson. CLICK ON BREAKING POWERSPORTS NEWS at the top of the page!! 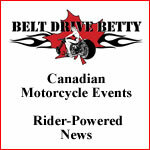 You can see news feeds from all kinds of sources such as CMG Online, Bike World, ATV Rider, Quad Crazy and lots more. Use the Powersports News Tab each time you visit BLUEBOOKTRADER.COM for all your latest ATV, Motorcycle and Snowmobile News!! Look for interesting new additions in the near future as wll!! Posted: Wed, Apr 13, 2011Industry Watch : What's New at The BLUE BOOKS!!! The Blue Book is printing a very informative 8th Edition Specification Manual. In the past the manuals have contained 15 years but this new edition will contain "25 years". It will cover model years of 1977-2011. There will be a dealer directory in the book as well. If you are a dealer and interested in putting you dealership in this new spec manual, please call the office or email anytime!! The Specification manual is sold to the general publc along with dealers nationwide!!! Posted: Wed, Mar 16, 2011Industry Watch : Ducati Launches Corse Iphone App. The Ducati Corse App puts the MotoGP Championship in the palm of your hand! Cupertino, Calif. (16 March 2011) - To celebrate the start of the 2011 MotoGP season, Ducati has released the official Ducati Corse Iphone App via the Apple App Store and iTunes. Discover everything you need to know about the Ducati MotoGP Team with Valentino Rossi and Nicky Hayden and hold all the secrets of the Ducati Desmosedici in your hand. The new app is free and full of info direct from the Ducati MotoGP Team pit garage and factory in Bologna. Receive rapid updates on races, results and championship standings right in the palm of your hand. All of this comes in addition to all the latest trackside news and a wealth of additional information from the world of Ducati. News, events and facts from the Ducati MotoGP Team pit garage. Ducati rider profiles and Desmosedici GP11 data. Extensive image gallery with many photos to download and share. MotoGP championship calendar and constantly updated results and standings. Tons of additional content from the world of Ducati. The Ducati Corse app is compatible with iPhone (3G or later), iPod Touch and iPad. It requires iOs 4.2 or later. For more information, please visit www.ducatiusa.com. 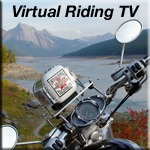 Artilcle by http://www.canadianmotorcyclerider.ca Many Great Article on this site!!! The first opportunities to view the new Honda Gold Wing will be at the International Motorcycle Show in Greenville, South Carolina, February 25-27 and Daytona Bike Week in Daytona Beach, Florida, March 5-12. 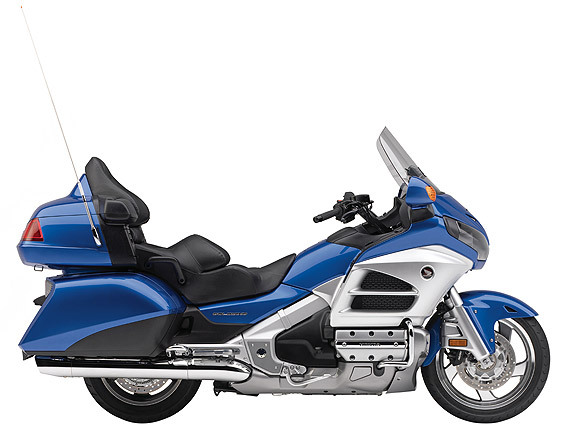 Long acknowledged as the pinnacle of two-up motorcycling, the 2012 Gold Wing continues its remarkable legacy. Its travel-oriented creds include the latest generation of sophisticated electronic amenities, starting with an updated and innovative GPS navigation system with user-friendly programmability for sharing favorite ride routes with friends and other riders, which can be accessed online via computer. The Gold Wing also now incorporates a built-in MP3/iPod interface for a new SRS CS Auto technology surround-sound system for a premium listening experience. In addition to its renowned power-laden yet refined drivetrain and delightfully sporty handling, the 2012 Gold Wing also brings upgraded styling, increased luggage capacity, greater protection from wind and weather, revised suspension settings for enhanced ride compliance, and unparalleled comfort for both rider and passenger. In addition, packages for Navi, ABS and airbag do much to further the Gold Wing’s reputation as the most celebrated touring machine in motorcycle history. Price: $23,199 USD to $28,499 TBD. Availability: May 2011. H-D1™ has arrived. Join the revolution in factory customization. H-D1™ is a revolution in custom bike-building, all about designing a Harley® just for you. Check out factory customization and our new online Bike Builder for the new 1200 Custom, or tailor any bike – a new one or the one in your garage – to your tastes with Fit Shop. With over 8,000 Parts & Accessories to pick from, we've got all the options you could want. about creating your dream bike. customize your Harley. It all begins here. FIND A DEALER GO TO THE DEALER DIRECTORY ON BLUEBOOKTRADER.COM We have the largest dealer directory across Canada with accuracy!! The latest Ski-Doo snowmobiles, riding gear and accessories will be on display, along with other BRP products at the new BRP Ultimate Playground Spring Tour. Not only will you be able to see the 2012s up close and personal, but you can win $50,000 in BRP vehicles in the Dream Garage sweepstakes. The Rotax ACE 600 engine is technology for everyone. With the industry’s best fuel economy – ever, almost no maintenance, 60 hp and a nice quiet sound, it’s a great choice for enjoying winter with the greatest of ease. Chassis Reinforcement Kit same style as on the new Freeride model. We never stop working to make snowmobiles better. Enter the new rMotion rear suspension. It’s totally rising rate, has the longest travel in the industry and trick new adjustments for fine-tuning. And it all fits inside the tunnel for no compromises. Explore rMotion and see media reviews. Nick Musters is attempting to set a new record in support of the Kelly Shires Foundation, which helps families fighting breast cancer. He’ll be riding laps around Ontario’s Bigwin Island on an MX Z TNT with Rotax E-TEC 800R engine in an attempt to ride the longest distance on a snowmobile in 24 hours. Most of us got started in snowmobiling when a friend or relative took us for a ride. Without that simple gesture many wouldn't be hooked today on the activity we love. Now it's your turn to do the same - Take one of your non snowmobiling friends out for a ride during Take a Friend Snowmobiling week, Feb. 12-22, and show them what they're missing. Everyone who participates can win $250. Yamaha Motor Canada is proud to announce their qualifying 2010 Five Star Dealers! The Yamaha Five Star Dealer Program is a progressive dealership improvement plan used to increase the professionalism of our dealer network and heighten the value received by Yamaha customers. In order to attain or retain their Five Star standing, each year a dealer must apply and successfully complete the Five Star measurement criteria as determined by Yamaha Motor Canada. Criteria is updated and adjusted accordingly to reflect market conditions. Retail sales results are not a component of the measurement process. 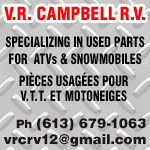 Yamaha Motor Canada boasts the finest recreational vehicle dealership group in Canada. Through hard work, dedication and a commitment to excellence, 77 Yamaha dealers have been awarded the prestigious 5 Star designation for 2010. This is up from the 61 who were awarded Five Star status in 2009. Rest assured, when a customer visits one of the following Yamaha Five Star dealers, they can expect to receive the best end to end customer care in the recreational vehicle industry. Congratulations to new and existing Five Star dealers! It's a 20-foot-long, twin-engined, fully streamlined blue bullet that recently set the outright motorcycle land speed record of more than 376 mph on the Bonneville Salt Flats in Utah. And now it's coming to the Motorcycle Hall of Fame Concours d'Elegance in Las Vegas, Nev., Saturday, Nov. 20, as part of the AMA Legends & Champions Weekend at the Red Rock Casino, Resort and Spa. The impressive Top 1 Oil Ack Attack streamliner, built by designer Mike Akatiff and piloted by racer Rocky Robinson, eclipsed the previous record by 8 mph in September, notching a two-way average speed on the table-flat Salt Flats of 376.363 mph. With motive force coming from a pair of turbocharged and intercooled Suzuki Hayabusa motors, the motorcycle is a one-of-a-kind engineering marvel that few get to see up close. Spectators at the Motorcycle Hall of Fame Concours d'Elegance, however, can appreciate this machine along with dozens of other rare and impeccably restored motorcycles that represent the finest examples of their breeds in the country. The Concours takes place on day two of the AMA Legends & Champions Weekend at the Red Rock, which features the Motorcycle Hall of Fame Induction Ceremony on Friday evening, Nov. 19, and the AMA Racing Championship Banquet, presented by World of Powersports, on Saturday, Nov. 20. Akatiff and Robinson will be honored for their accomplishment at the noontime racing awards gala. "Land-speed racing is the stuff of which legends are made, so it's just amazing to have the machine that just set the outright world's record on display at the Motorcycle Hall of Fame Concours d'Elegance," said Tom White, who is coordinating the gathering of world-class motorcycles. "To think that people will be able to stand just a few feet from a machine that went, at one point in the run, more than half the speed of sound -- that's just incredible! A chance like this doesn't come along very often." "We're happy to be a part of the weekend and the Concours," said Akatiff, who has twice held the motorcycle land-speed record before regaining it a third time in September. "We get a real kick out of seeing all the Hall of Famers and the other motorcycles, and we hope people enjoy seeing our motorcycle, as well." Entry to the Motorcycle Hall of Fame Concours d'Elegance, which starts at 9:30 a.m., is granted with a $10 donation to the Motorcycle Hall of Fame Museum. Anyone holding a ticket to either the Friday Hall of Fame Induction Ceremony or the Saturday AMA Racing Championship Banquet, presented by World of Powersports, can attend the Concours at no additional charge. In addition, an autograph-signing session will take place during the Concours starting at 10 a.m., featuring 2011 Hall of Fame inductees and a number of other notable Hall of Famers. Tickets to the Hall of Fame Induction Ceremony are $89, which includes dinner. Tickets to the AMA Racing Championship Banquet, presented by World of Powersports, are $69 per person and also include a meal. Special packages are also available. In addition, guests at either or both banquets receive a special Red Rock room rate of just $90 a night, plus tax: a $150 discount off the normal rate. Banquet tickets, reservations and additional event information can be found at AmericanMotorcyclist.com/LegendsAndChampions. Two well-known motorsports announcers, Laurette Nicoll and Griff Allen, are teaming up to emcee the 2010 AMA Racing Championship Banquet, presented by World of Powersports, at the Red Rock Casino, Resort and Spa in Las Vegas, Nev., on Saturday, Nov. 20. Both Allen and Nicoll have hosted the annual event in the past, and in 2010 they will combine their talents for the afternoon gala celebration of the year's finest amateur racers. "I'm honored to again have the opportunity to share the stage with so many tremendous and fearless AMA Racing athletes," said Nicoll, an amateur racer herself whose announcing credits include AMA Endurocross, AMA Pro Racing Supermoto, AMA Mini Moto SX, and the Winter and Summer X Games.Griff Allen"The AMA puts together an amazing show to celebrate our up-and-coming riders, and also some of the best-known racers to ever throw a leg over a motorcycle," said Nicoll. "To gather so many generations and genres together in one room is pure magic." Allen is perhaps best known for his regular appearances on ESPN2 as host, pit reporter and expert analyst and as a live commentator for many events, including AMA Superbike races and most recently, AMA Vintage Motorcycle Days. Since 1924, the AMA has protected the future of motorcycling and promoted the motorcycle lifestyle. AMA members come from all walks of life, and they navigate many different routes on their journey to the same destination: freedom on two wheels. As the world's largest motorcycling rights organization, the AMA advocates for motorcyclists' interests in the halls of local, state and federal government, the committees of international governing organizations, and the court of public opinion. Through member clubs, promoters and partners, the AMA sanctions more motorsports competition and motorcycle recreational events than any other organization in the world. AMA members receive money-saving discounts from dozens of well-known suppliers of motorcycle services, gear and apparel, bike rental, transport, hotel stays and more. Through its support of the Motorcycle Hall of Fame Museum, the AMA preserves the heritage of motorcycling for future generations. For more information, please visit AmericanMotorcyclist.com. It's said to feature a 800cc V4 engine. That's good. Triumph's new 800cc models are going to be tough to beat in terms of power and torque though. It'll have to be 'really' good. 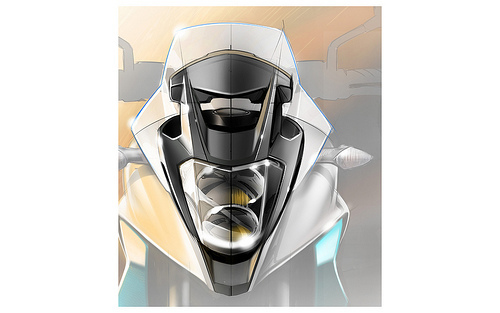 The fairing features a 'floating' instrument panel to put the gauges closer to the rider’s peripherial vision. The fairing is said to improve high speed stability as well as engine cooling. PICKERINGTON, Ohio -- The U.S. Environmental Protection Agency has agreed to allow the ethanol portion of blended gasoline to be increased from the current 10 percent to 15 percent for certain vehicles, which could pose a danger for motorcycles, the American Motorcyclist Association (AMA) reports. On Oct. 13, the EPA announced approval of a waiver for E15. Under the decision, E15 is now approved for use in model year 2007 and newer cars and light trucks. It isn't approved for use in any other gasoline-fueled engines. To see the EPA news release, go to http://tinyurl.com/US-EPA-E15. "The AMA supports the use of cleaner-burning fuels, but we are concerned that gasoline containing more than 10 percent ethanol could result in premature engine damage or failure while a motorcycle is being ridden," said Imre Szauter, AMA government affairs manager. "We're also concerned about any degradation in performance, fuel economy and rideability that may result from the long-term use of blended fuels with greater than 10 percent ethanol." The EPA, in allowing more ethanol in gas, specifically said that its decision covers model year 2007 and newer cars and light trucks, and no other vehicles at this time, including motorcycles. "Motorcycle manufacturers only certify their machines to run on gasoline or a blend with up to 10 percent ethanol, which is known as E10," Szauter said. "So using the 15 percent blend in a motorcycle could void the bike's warranty." Growth Energy, an ethanol lobbying group, asked the EPA in March 2009 to allow gasoline to contain up to 15 percent ethanol. It's part of an effort to meet a congressional mandate to increase to 36 billion gallons the amount of renewable fuel available in the United States by 2022. Ethanol, made from corn and other crops, is considered a renewable fuel. For more than three years the AMA has been on the record opposing increases in the ethanol level allowed in gasoline until studies show that an increase won't damage motorcycle or all-terrain vehicle (ATV) engines, and won't make motorcycles emit more nitrogen oxides than are allowed by the EPA. "The message we want to deliver today is that once E15 gas is offered for sale, there are a variety of reasons not to put it in your motorcycle or ATV gas tank," Szauter said. "In fact, the EPA even says you aren't allowed to put E15 in your bike." The EPA said a decision on the use of E15 in model year 2001 to 2006 vehicles will be made after new test results are received. The EPA is also proposing E15 pump labeling requirements so that consumers don't mistakenly put E15 in the wrong vehicles. Bob Greco, spokesman for the American Petroleum Institute, told The Wall Street Journal that by approving E15 without full testing, the EPA is putting "politics before science." "You're going to have fuels in the marketplace that could damage engines and void warranties," Greco told the newspaper. The AMA is a member of AllSAFE, the Alliance for a Safe Alternative Fuels Environment, a group formed to ensure that fuels containing ethanol are promoted in a thoughtful manner. AllSAFE is made up of associations that represent consumer and commercial users of ethanol blends, manufacturers of boats, vehicles, engines and equipment, and retailers who sell gasoline and ethanol-fuel blends. ©2019 BlueBookTrader.com. All rights reserved.